On what seemed a very ordinary winter day, Bob and I took a leisurely walk over to one of our local parks to escape the routine of familiar household chores. Milliken Park in Toronto, Ontario, was almost deserted. Though we scanned bushes and trees, not a single bird was seen until I noticed a solitary Cooper’s Hawk perched on a sunlit branch. 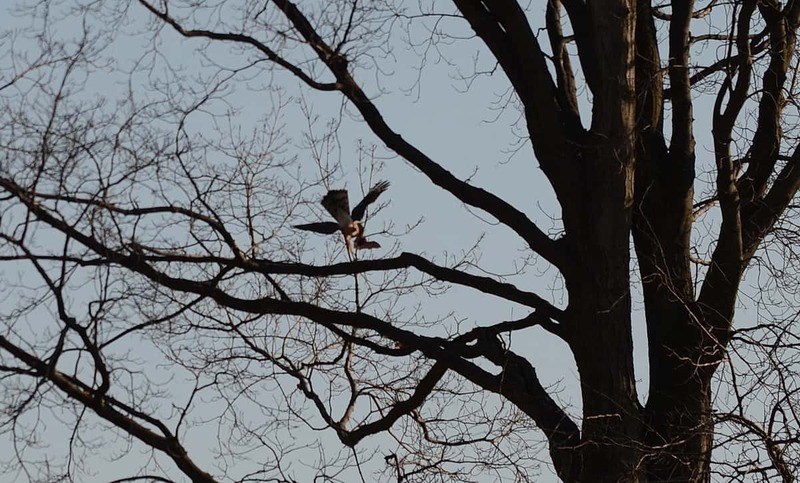 Seconds later, the hawk launched into the air and nabbed a Big Brown Bat that was flying by. In the process of raising my camera lens to photograph the Cooper’s Hawk, I missed the fact that the hawk had taken flight from its original perch. Looking through the viewfinder, I was disappointed to discover an empty branch. 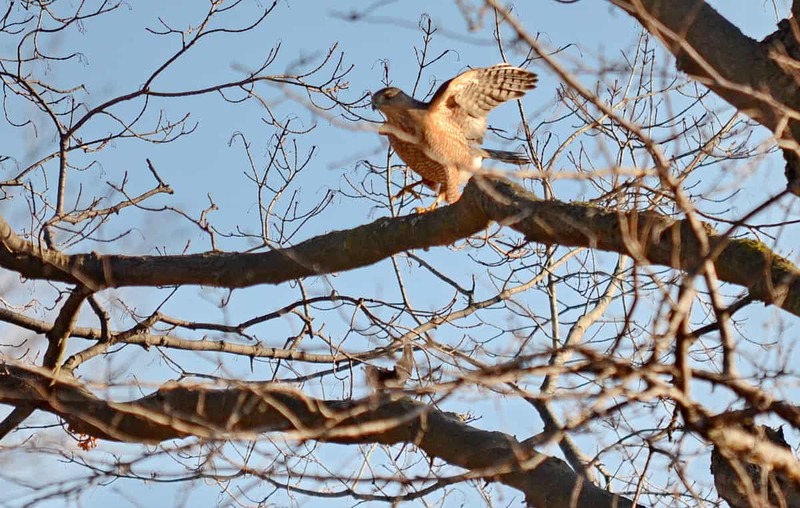 Keeping an eye on the Cooper’s Hawk, Bob was tracking the action and foresaw the fate of a small bird flying by. It was in the hawk’s sights. 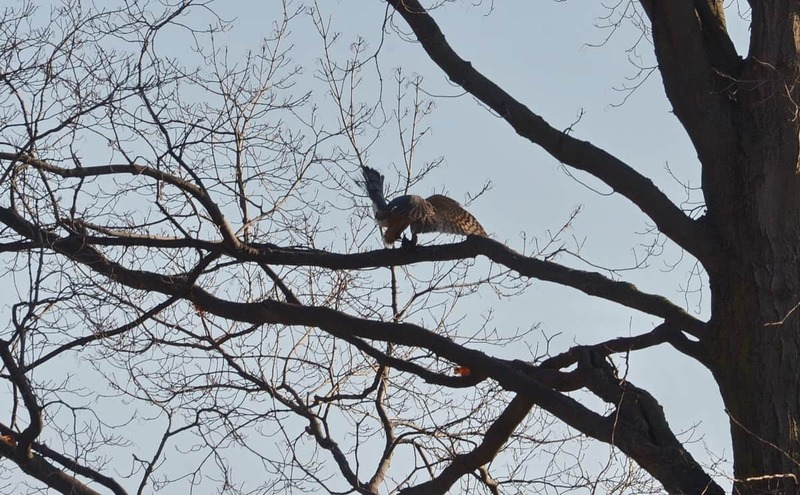 I was in react mode and barely managed to catch the Cooper’s Hawk in flight, but I made a valiant effort to locate the hawk as it moved towards a nearby tree. Still focusing on the action, I paid little attention to the hawk’s prey. Bob and I were a good distance from the Cooper’s Hawk, so we merely kept snapping photos as we adjusted our position in search of a better vantage point. 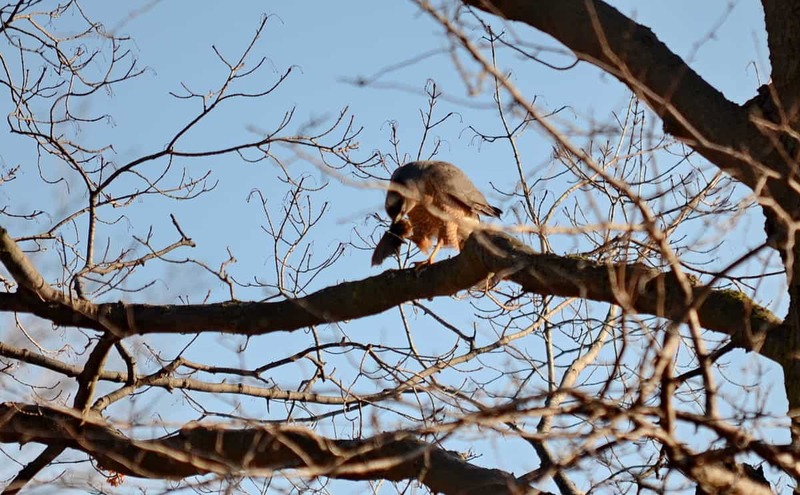 The Cooper’s Hawk seemed in no rush to devour its prey. In fact, what took place in a matter of minutes had Bob and me baffled. The Cooper’s Hawk seemed to be shaking one leg and almost fighting with its intended meal. The hawk was struggling to subdue its prey. 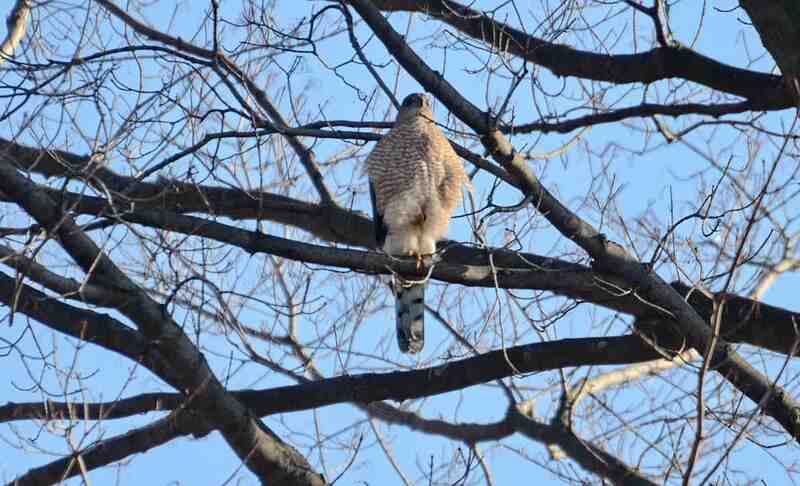 Never before had we observed a Cooper’s Hawk hopping about, changing positions erratically and obviously distressed. Suddenly, I heard a small squeak as the limp prey fell towards the ground. 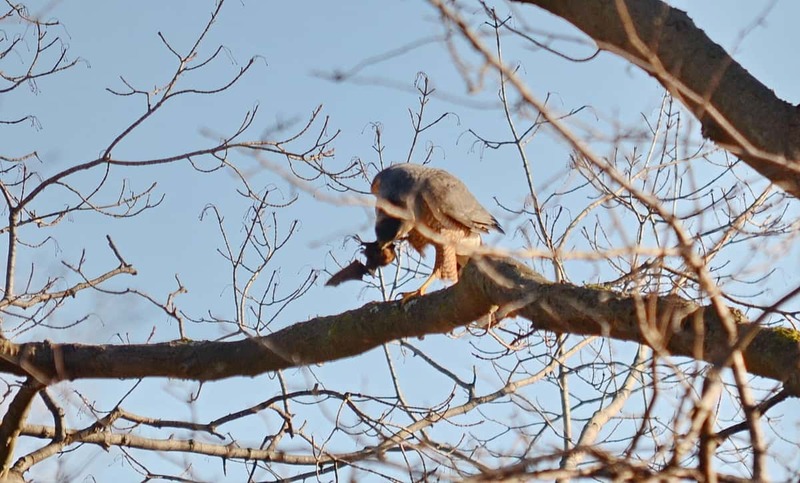 We assumed that the Cooper’s Hawk had simply lost its grip on the intended meal. In this photo you can get a glimpse of the creature as it tumbles through the thin branches. Next, the Cooper’s Hawk retired to a distant tree, so we stood back expecting that the hawk would come to retrieve its lost prey. 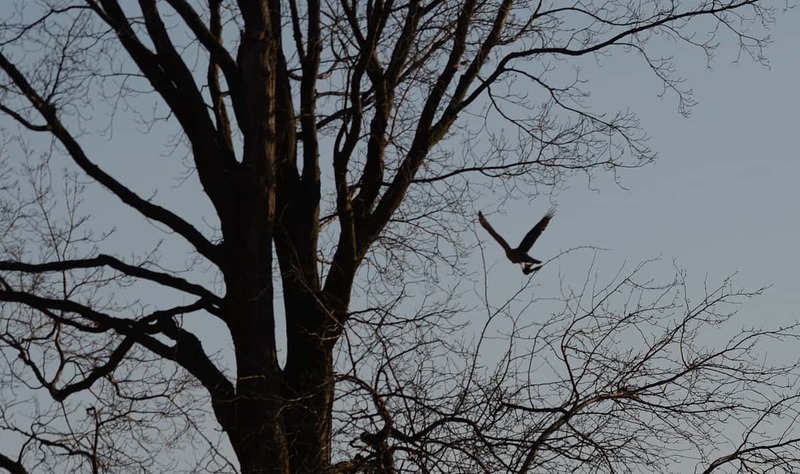 Instead, the Cooper’s Hawk flew west over a row of neighboring homes. 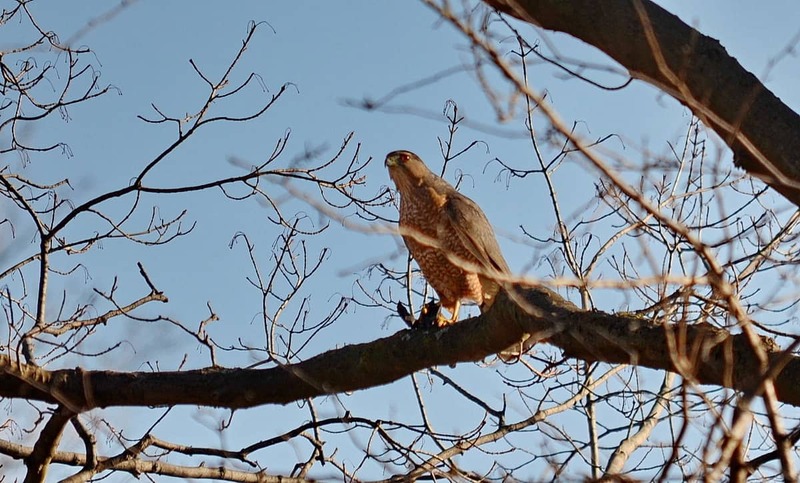 Bob and I felt confident that the Cooper’s Hawk had abandoned its intended meal, so we drew near the base of the tree below the branch where the struggle had ensued. What we found astounded us. 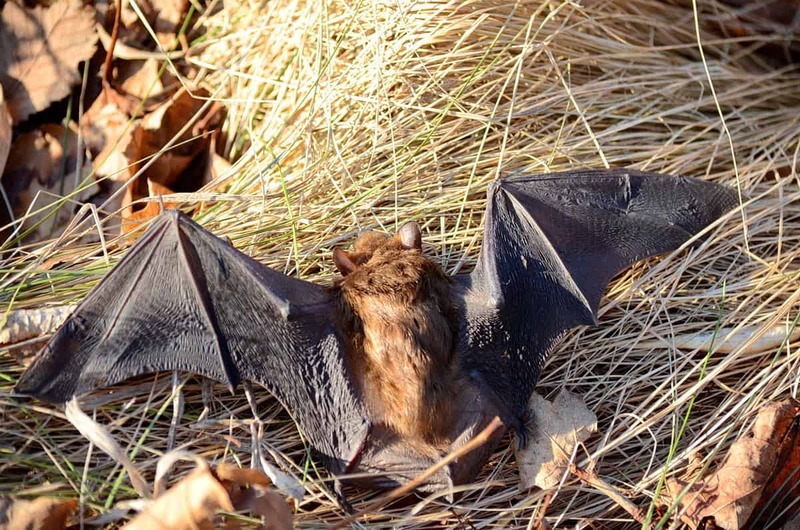 The fallen creature was not a bird but a Big Brown Bat. 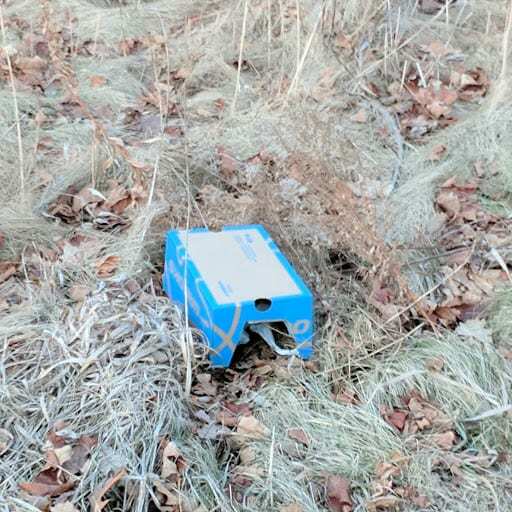 The Big Brown Bat appeared to be dead, so we could not understand why the Cooper’s Hawk did not recover it from the dried grass. Very carefully, Bob gently lifted the Big Brown Bat onto his gloved hand. It was evident that the wee mammal was still breathing and moving. The bat was obviously injured, and it seemed heartless to simply walk away and leave it there to die. 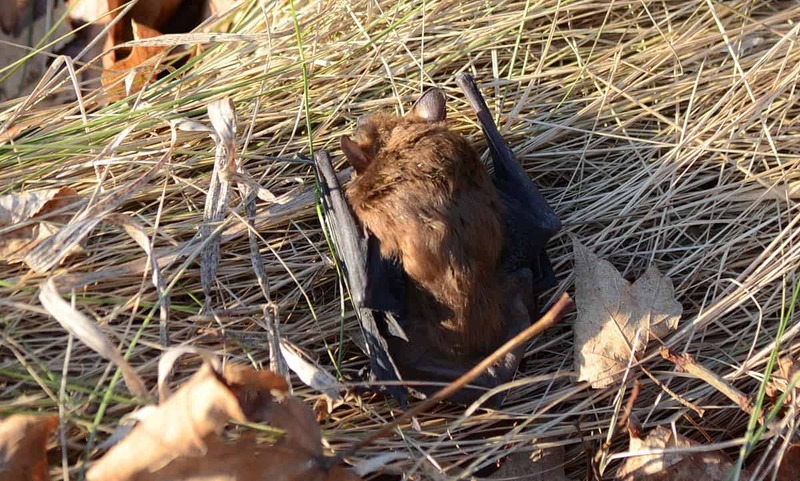 With extreme tenderness, Bob placed the Big Brown Bat back onto the weathered grass though we moved it away from the tree trunk to a spot where continued sunshine would be a benefit. It was going to be a very cold night. 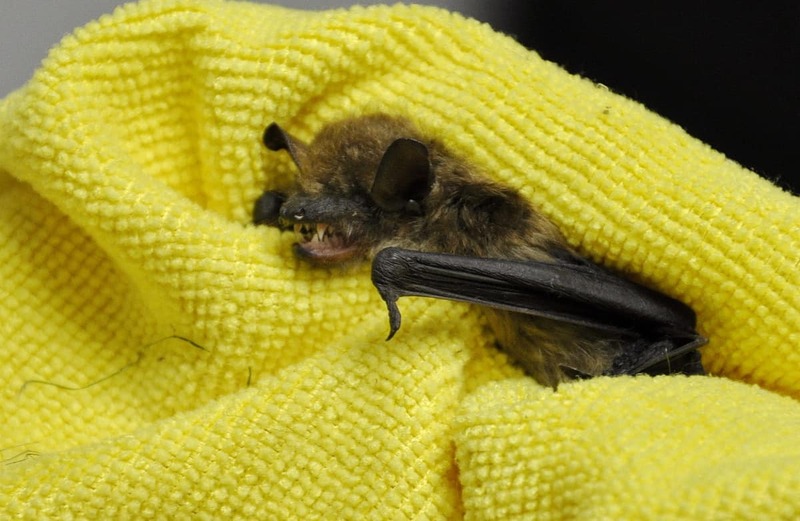 While pondering how to proceed, Bob called the Metropolitan Toronto Zoo and spoke to a bat specialist who recommended providing a temporary shelter for the bat to protect it from the night’s chill. A quick trip home to fetch a shoe box was in order. At the same time, we tried to contact a wildlife centre in Toronto but the late afternoon hour would have required leaving a message. 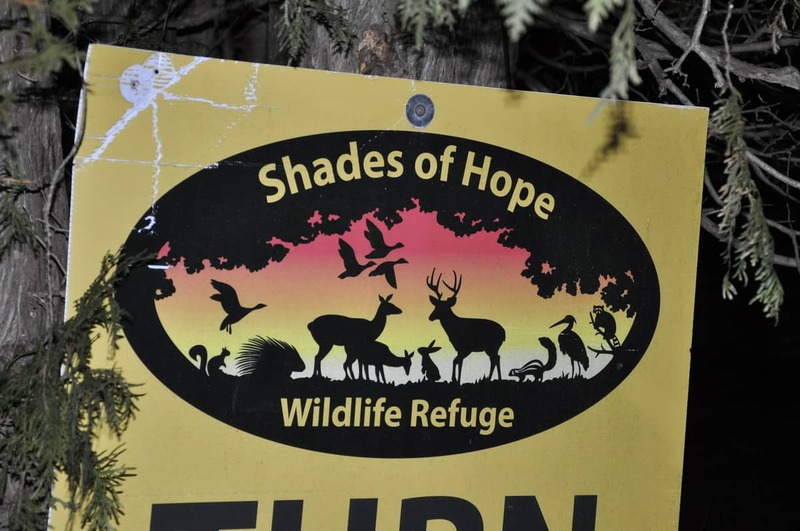 Next, with input from friends, we managed to reach Shades of Hope Wildlife Refuge in Pefferlaw. The lady to whom we spoke strongly urged us to bring the Big Brown Bat in for assessment and treatment. Putting dinner preparations on hold, Bob and I collected the Big Brown Bat and without delay proceeded to drive the hour to Shades of Hope. They were awaiting our arrival. A short few minutes were spent in the office while we waited for staff to greet us. They were busy tending and treating some of their over 100 wild creatures that required attention. Caregiver Gail warmly greeted us and carefully removed the Big Brown Bat from the cardboard container that housed it during the car ride. 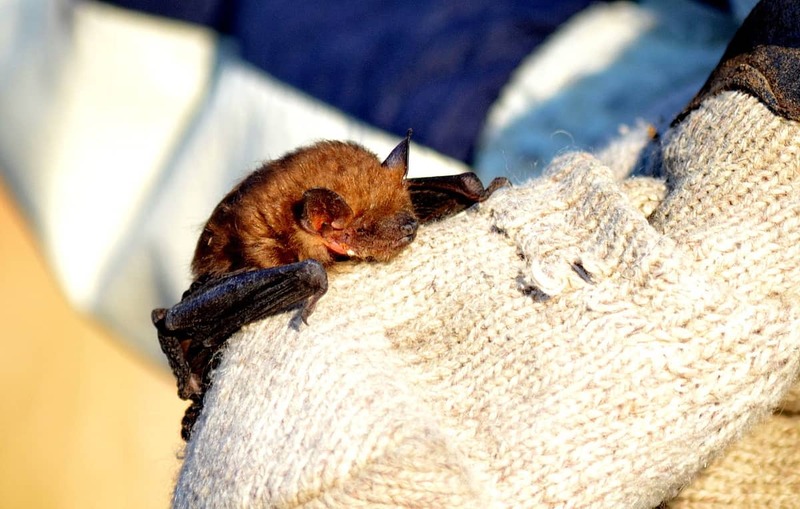 The warmth inside our vehicle had comforted the bat and inspired a little more activity. 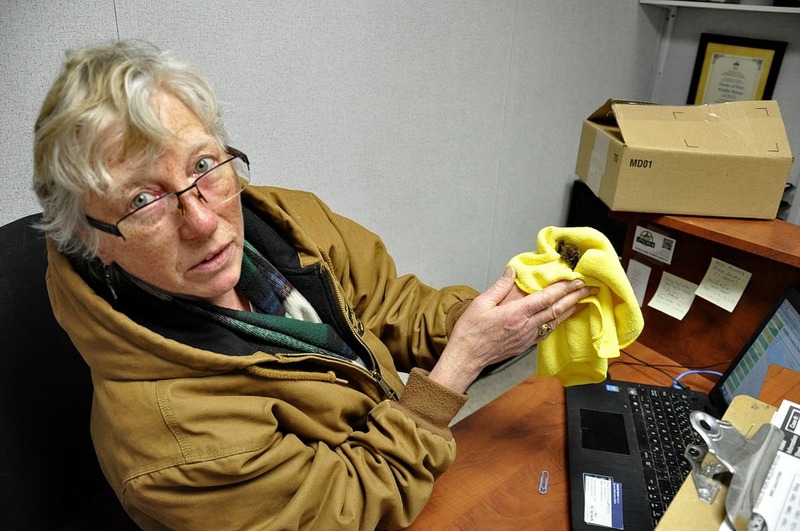 While I filled out an information sheet with details of where and when the Big Brown Bat was found, Gail quickly and efficiently assessed the bat. It is a male with a minor injury on the side of his neck, his eyes were not damaged, and he appeared to be a healthy specimen. The Big Brown Bat was feeling rather feisty by this time and even gave a little attitude. No wonder after what he had been through in the past few hours. 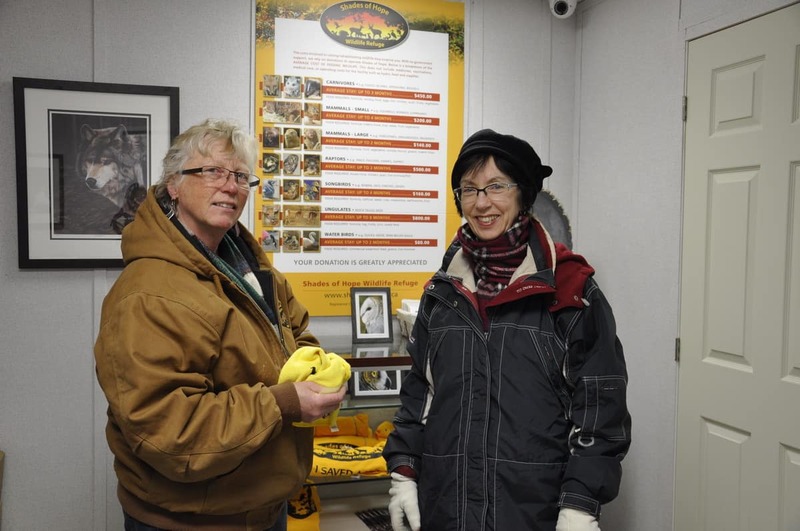 With our thoughts now turning to the drive home, Bob and I left the Big Brown Bat in Gail’s capable hands. Already, the next morning, Shades of Hope provided an update. Our little bat buddy was responding well to treatment and was very comfortable. He would be spending the rest of the winter in a warm, cave-like environment so he would be ready for release in the spring. Wow! 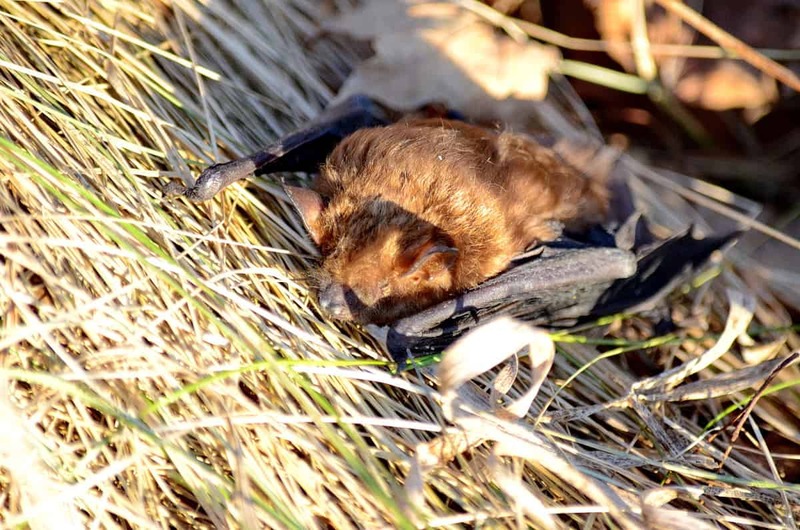 What an interesting experience and what a lucky bat–thank you for sharing your story! Thanks, Laurie. I’m so glad you enjoyed reading about it. The bat is doing very well. 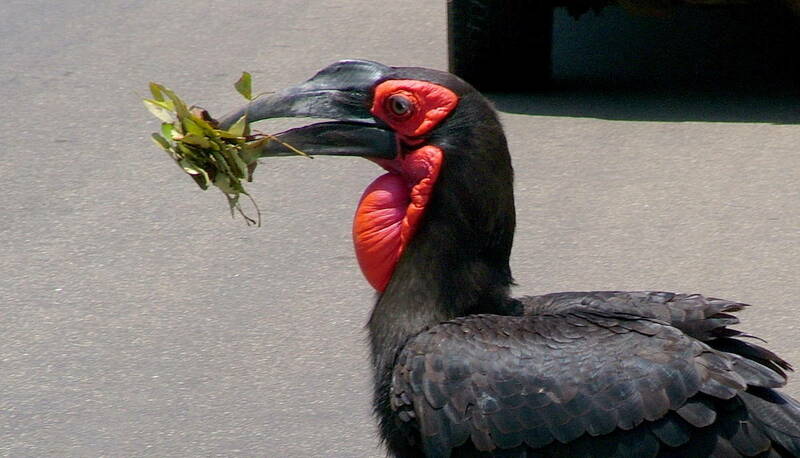 Every 2 weeks, they wake him up and feed him meal worms. He is quite cranky, I’m told, when they do so. All the rescued bats are kept in individual dark “condos” in a cool room and will be re-released into the wild come springtime. thank you so much for sharing this amazing story… and even more thanks for taking the time to save this little feisty creature. You’re a great team! So glad you liked our story! Thanks so much for your positive feedback. 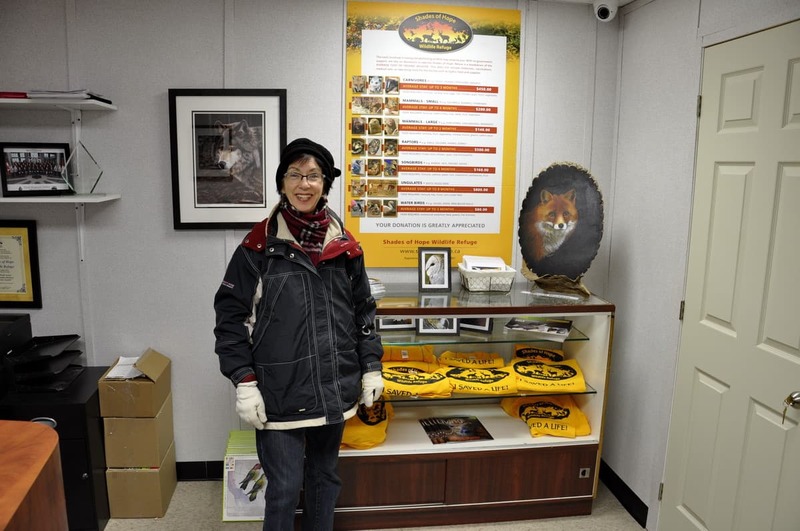 It means a lot to hear from our readers and that they see the value in our efforts to help wildlife. Thanks so much, John. 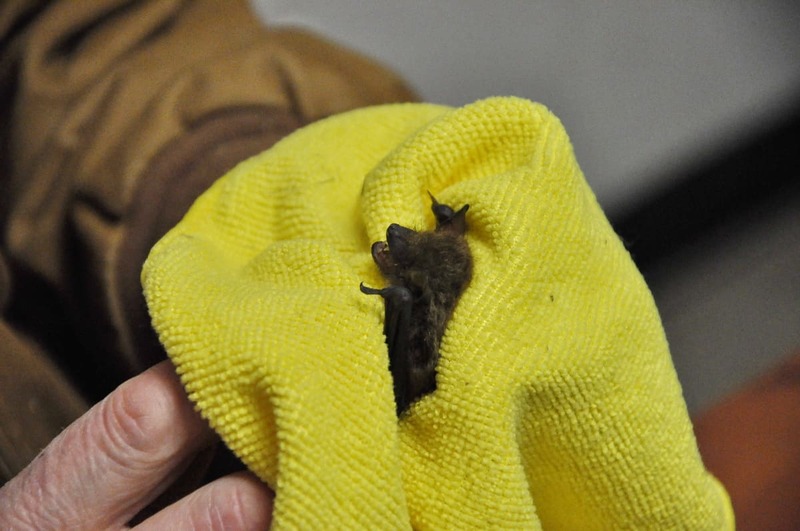 At first, we, too, thought the Bat would be a goner, but the caring staff at Shades of Hope assured us that its chances of survival were pretty good based on what we had told them of its injuries. We were so happy to save this little creature given the present threat to the existence of bats in general from White Nose Syndrome. What an amazing story! How wonderful that you spent so much of your time to assist this little bat. Thank you for your caring actions. thanks so much, Susan. Glad you enjoyed reading about our little bat buddy. He is now warm and sleeping the winter away.